In this pAsuram, maNavALa mAmunigaL assumes that SrI rAmAnuja asks him a question. The question is “hey!!! maNavALa mAmunigaL! As per the phrases ‘nizhalum adithArumAnOm (periya thiruvandhAdhi 31)’, ‘mEvinEn avan ponnadi (kaNNinuN chiRuth thAmbu 2)” and ‘rAmAnuja padhachchAyA (embAr’s thaniyan)‘, you yearned for the state of those devotees who are the embodiment of pArathanthriyam”. (pArathanthriyam is a quality by which the servant (owned) is completely dependent on the master(owner). The master uses the servant at his will and the servant because of his true nature does not voice any concern at any time.) SrI rAmAnuja continues, “this kind of connection with me is only possible for the likes of vaduga nambi”. maNavALa mAmunigaL answers to this by saying that “hey SrI rAmAnuja!!! Please give me the state of vaduga nambi who knew no god apart from you. Please inculcate that state in me. After doing that, please use me in whatever way you want to for how much ever time you desire”. AtkoL ugandhu – (Oh! emperumAnArE) Please use me happily for your service. unRanakkE – for you only. maNavALa mAmunigaL, in this pAsuram, requests SrI rAmAnuja to bless him the state of vaduga nambi. vaduga nambi was a Sishya of SrI rAmAnuja who knew no god except his guru SrI rAmAnuja. maNavALa mAmunigaL asks SrI rAmAnuja to grant him that state and asks him to use him at his will happily. He goes ahead and says that he will be happy to serve SrI rAmAnuja at all times. maNavALa mAmunigaL says “Oh! The leader of sanyAsis! Please bless me with the state of vaduga nambi”. 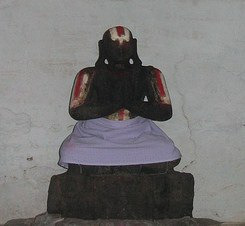 vaduga nambi was a Sishya of SrI rAmAnuja. He knew no other god except his guru SrI rAmAnuja. vaduga nambi considered even the periya perumAL at SrIrangam as an eternal hindrance to his kainkaryam to SrI rAmAnuja. He was unlike some people who went to both, one being perumAL and the other being the AchAryan. vaduga nambi regarded his AchAryan SrI rAmAnuja as his everything and did not pay any heed in the direction of perumAL. For this extreme devotion to SrI rAmAnuja, he is celebrated at the highest pedestal. maNavALa mAmunigaL continues “Oh! emperumAnArE!!! As AzhvAr said “enakkE Atchey ekkAlathum (thiruvAimozhi 2.9.4)“, please use me for your service only at all times. adiyEn is at your disposal and please use me for your happiness!!! Wherever you go, please take me and use me for your service and subsequent happiness!!! The phrase “mannu pugazh sEr vaduga nambi nilai” can also be interpreted as “mannu nilai sEr vaduganambi”. The latter split / connotation would put the adjective “mannu nilai sEr” as the qualifier for the noun vaduga nambi. This would mean vaduga nambi who stood in the charama parva nishtai state, that attained timeless glory. This entry was posted in Arththi prabandham, Other and tagged arththi prabandham, mamunigal, ramanuja on July 13, 2016 by santhanam rajagopalan.